Two years. That's how long I've been writing this column. That's a longer run than most television series can muster. It's more than twice the average life span of a comic-book series published by Rob Liefeld. And it's about the same length of time that passes between supposedly monthly issues of "Battle Chasers." So, as Frosty the Snowman once said, "Happy Birthday!" This column has reached its terrible twos, and, like any 2-year-old, it's only just getting the hang of the big words. I've been getting more e-mail lately, some of it actually written in complete sentences. SkellingtonScribe, not his real name, asks, "Who would win a street fight between you and Harry Knowles?" That is a toughie, Skellington. First, for those of you who've never heard of him, Harry Knowles is the Matt Drudge of the sci-fi geek universe. From his lair in Houston, Texas, he runs an influential Web site called Ain't It Cool News. Ain't It Cool News gained a reputation early on for being able to uncover the latest rumors and goings on in Hollywood, especially as far as big-budget sci-fi epics like "Star Wars: Episode I" were concerned. Nowadays, Harry's site is a day late on most of its rumors, and most of its biggest exclusives turn out to be bogus. That, however, didn't stop Harry from making two appearances as a guest critic on Roger Ebert's TV show. And, of course, there is the small matter of Harry's tarnished credibility as a reviewer, especially after he gave a favorable mention to "The Faculty," a stinker of a film in which Harry just happened to have a cameo role. But to get back to Skellington's question, I'd have to give the street fight to Harry. If you've ever seen him, you know that Harry is a huge man -- the sort of man who takes up half the movie screen even in Panavision. His size advantage alone is enough to do me in. If given a choice, I'd much rather have a knock-down, drag-out with Garth Franklin, the Jimmy Kimmel lookalike who runs the sci-fi entertainment gossip site, Dark Horizons. But thanks for the question, Skellington, and, as for the rest of you, keep those cards and letters coming! Getting back to the subject of the terrible twos, I vow to hate even more movies and television shows in the coming year, because, as comic-book scribe Warren Ellis once said, the best thing about the English language is that it's so good at expressing hate. Well, we're getting off to a splendid start. Over the weekend, I saw "Hollow Man," the latest opus from director Paul Verhoeven, who gave the world "Starship Troopers" and "Basic Instinct," two films that would be capital offenses in less tolerant countries. With the latex mask on, Sabastian Caine (Kevin Bacon) appears to be hollow. "Hollow Man!" Get it??? 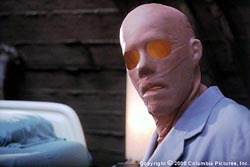 "Hollow Man" is an appropriately named film. Everything about the movie rings hollow. It stars Kevin Bacon as Sabastian Caine, an egotistical scientist working to create an invisibility formula for the U.S. government. After he succeeds in turning a gorilla invisible and back again, he tests the formula on himself. Sabastian, already a thoroughly unlikable character, falls in love with his newfound ability to skulk about unseen. He begins stalking his supermodel neighbor and, later, starts following his ex-love interest/fellow scientist, Linda, played by Elisabeth Shue. It's only a matter of time before Sebastian decides he must kill all his co-workers in order to keep the secret of invisibility to himself. For a film about invisibility, it sure is easy to see the plot twists coming. Ultimately, "Hollow Man" is a dumb movie full of dumb and annoying characters mouthing silly dialogue and forgetting to do obvious things -- like wear their infrared goggles so that they can actually see Sabastian coming. And why is the U.S. government so interested in invisibility, anyway, when heat and motion detectors can easily thwart it? Given current technology, invisibility isn't as impressive an ability as it was when H.G. Wells wrote "The Invisible Man" in 1897. A better director with a better script might still have breathed life into the idea. Unfortunately, all we got was Verhoeven, the man who made "Showgirls."